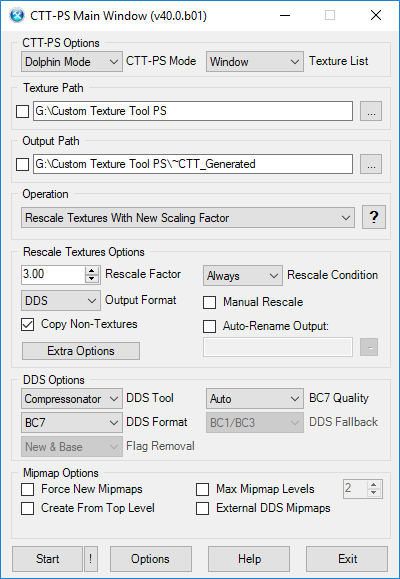 Using the operation "Rescale Textures With New Scaling Factor", it is possible to downscale by using a value lower than 1.00. For example, 0.50 would scale the textures down by half, and 0.75 would make them 25% smaller. They can also be output directly to BC7. As an example, the settings below should get you what you want. EDIT: Now that I think about it, Dolphin textures (tex1) and normal textures are not treated the same. Dolphin texture dimensions can be retrieved from the file name, so you would NOT want to use 0.75, you would want to use 2.00 for half resolution, and 3.00 for 25% smaller. This is assuming that most textures in the pack have resolutions multiplied by 4x (which is the case). I downloaded it, set everything up, and booted up the game. The custom textures loaded successfully, but they appear in a low resolution. I tried using the downloads from both mirror 1 and 2, and the 1080p and 2160p packs from both mirrors, but they all seem to yield the same results. I've attached images of the title screen and the file select screen, which show the low resolution that the HD textures appear in for me. I don't think I have any wrong settings, since I've played Zelda the Wind Waker with an HD texture pack too, and that looked just fine. I'm pretty unfamiliar to how Dolphin and emulation works, so if someone could help me out I'd greatly appreciate it, and I can provide any screenshots of my settings of Dolphin if needed. It's fixed, thank you so much JosJuice! I can't believe it was such a simple change in the settings lol. I will now go and enjoy the game, thanks and have a nice day! I like what you did but why is some of it so blatantly inaccurate? Something to do with the process or what? I've gone and said thanks in the 60 fps thread too, but had to say it here - you've all really done an incredible job. I can't thank you enough. Filled a hole in my heart and thoroughly entertains my kids while "I" get to have a go. Looking forward to my son graduating to this once he's played through everything on the SNES classic - he has to go around the long way! @Scribblette: Glad you like it, enjoy! @Smashbro29: It depends on what you are talking about specifically. This pack has almost 40 different contributors over the course of years, all with varying levels of "skill" when it comes to making textures. Some textures may have just been too hard to remake for whoever made it while others may have had some intentional changes if the retexture looked "better". With the vast amount of contributors this pack has had and the vast amount of textures this game has, without specific examples I can only give a general answer. Such as: nobody made a better one. A lot of the UI is not entirely perfect, many of the bars and icon retextures are the same as their original counterparts, but some things may be thinner or thicker, some bars may not match 100%, some icons may not match perfectly, etc. To try to get all that stuff to look exactly the same only at a higher resolution is nothing short of masochism. The portraits are different because its the only high resolution artwork that exists. The original portraits could probably be upscaled and retouched, but nobody has taken that up. Some things are nearly impossible to recreate (mountains, grass, anything nature really) since the textures are realistic photographs of what they represent. You can take similar images, and get decent results that look close, but never close enough to be "accurate". Without a higher resolution photo of the same thing the only choice to keep it "accurate" would be to upscale the original textures. And only now filters are emerging that can actually upscale things like this with decent enough results.